Central Recovery Press, 9781942094470, 300pp. The body is where our instincts reside and where we fight, flee, or freeze, and it endures the trauma inflicted by the ills that plague society. In this groundbreaking work, therapist Resmaa Menakem examines the damage caused by racism in America from the perspective of body-centered psychology. He argues this destruction will continue until Americans learn to heal the generational anguish of white supremacy, which is deeply embedded in all our bodies. Our collective agony doesn't just affect African Americans. White Americans suffer their own secondary trauma as well. So do blue Americans--our police. 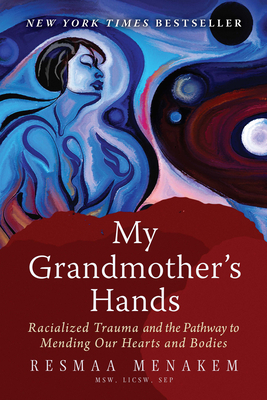 My Grandmother's Hands is a call to action for all of us to recognize that racism is not about the head, but about the body, and introduces an alternative view of what we can do to grow beyond our entrenched racialized divide. Paves the way for a new, body-centered understanding of white supremacy--how it is literally in our blood and our nervous system. Offers a step-by-step solution--a healing process--in addition to incisive social commentary. Resmaa Menakem, MSW, LICSW, is a therapist with decades of experience currently in private practice in Minneapolis, MN, specializing in trauma, body-centered psychotherapy, and violence prevention. He has appeared on the Oprah Winfrey Show and Dr. Phil as an expert on conflict and violence. Menakem has studied with bestselling authors Dr. David Schnarch (Passionate Marriage) and Dr. Bessel van der Kolk (The Body Keeps the Score). He also trained at Peter Levine's Somatic Experiencing Trauma Institute. Resmaa Menakem, MSW, LICSW, SEP, has appeared on both The Oprah Winfrey Show and Dr. Phil as an expert on conflict and violence. He has served as director of counseling services for the Tubman Family Alliance; as behavioral health director for African American Family Services in Minneapolis; as a domestic violence counselor for Wilder Foundation; as a certified Military and Family Life Consultant for the U.S. Armed Forces; as a trauma consultant for the Minneapolis Public Schools; and as a Cultural Somatics consultant for the Minneapolis Police Department. As a Community Care Counselor, he managed the wellness and counseling services for civilians on fifty-three US military bases in Afghanistan. Resmaa studied and trained at Peter Levine's Somatic Experiencing Trauma Institute, as well as with Dr. David Schnarch (author of the bestselling Passionate Marriage) and Bessel van der Kolk, MD (author of the bestselling The Body Keeps the Score). He currently teaches workshops on Cultural Somatics for audiences of African Americans, European Americans, and police officers. He is also a therapist in private practice.